The image of open source software has changed. No longer seen as the geeky, slightly awkward alternative to mainstream software, it’s now trendy, fashionable and super-cool. Well, OK, it still has the geeky edge and it’s still all about innovation. However, it has grown and matured to the point where everyone from small businesses to tech giants and global enterprises have open source at the core of their strategies. There’s no going back. We’ve reached the point where open source is providing viable and powerful alternatives to proprietary approaches or solutions. Open source projects now play a leading role in all the top strategic technology trends that are reshaping the world around us. 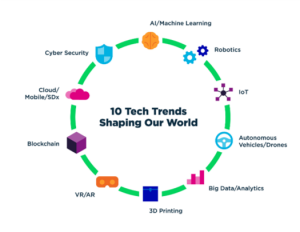 It is important that you understand and track these technology trends, even if you don’t plan to use them in the near future. According to Gartner, the business value derived from AI will be $1.2 Trillion this year. It’s expected to have an impact everywhere from customer support and chatbots to finance, research, machine learning, automating data center operations and security. AI and ML require huge datasets and the compute capacity for fast data analysis. Many organizations are using high-performance computing (HPC) solutions to get this done and the king of the HPC world is Linux. The world of robotics is awash with open source projects focused on hardware, software and robot simulators. One example is ROS (Robotics Operating System), an open-source platform built on Linux. ROS provides tools and libraries to make it easier to design and control complex robots. But there’s so much more available. Take a look at this Open-source Robotics Wikipedia page for a deeper dive into the open source options in this space. Forecasts suggest there’ll be 26 billion IoT devices by 2020 (Gartner), with IoT spending reaching nearly $1.4 trillion by 2021 (IDC). That’s incredible growth. IoT is moving us towards a smarter, more connected world. IoT solutions are already turning up in manufacturing, freight and transport, farming, asset management, smart infrastructure (homes, buildings, and cities), smart utilities (electricity, gas, and water) and even contextual marketing. The list is pretty lengthy – even without all the crazy IoT stuff that’s out there. The lion’s share of IoT devices are using embedded Linux. This makes perfect sense when you are looking for a real-time OS that is simple, lightweight, lean on resources and low cost. When it comes to moving processing and compute to the edge of the IoT network, OpenStack is proving popular for a distributed cloud model. Looking for other open source IoT options? Take a look at Linux.com or Postscapes.com for more information. On the other hand, Gartner says about 3 million personal or commercial drones were shipped last year. When these technologies really take off (excuse the pun), self-driving cars and drones are set to be among the most significant advances in modern history. Car manufacturers are beginning to realize that the open source approach of collaboration and cooperation will make it easier to resolve many of these challenges. Automotive Grade Linux (AGL) and OpenCV are gaining in popularity, while even Tesla has recently decided to release its open-source Linux code. For drones, open source has numerous projects to choose from. Take a look at the options on this Caldat.com list. Big data and data analytics is a common thread among many of the other trending technology areas, such as IoT, AI, ML and cloud computing. In addition, a quarter of all OpenStack cloud deployments are being used to run big data or data mining workloads. One additional open source project is worthy of mention. Managing exponential data growth is a major issue. Big data and analytics are forcing organizations to think carefully about storage variety, volume and velocity. Ceph is the open source software-defined storage solution that is helping solve this problem. Take a look at this SUSE blog to see why. Take a look at part 2 of my blog series, where I cover the remaining 5 of the top 10 technology trends and explain why open source is in the spotlight.